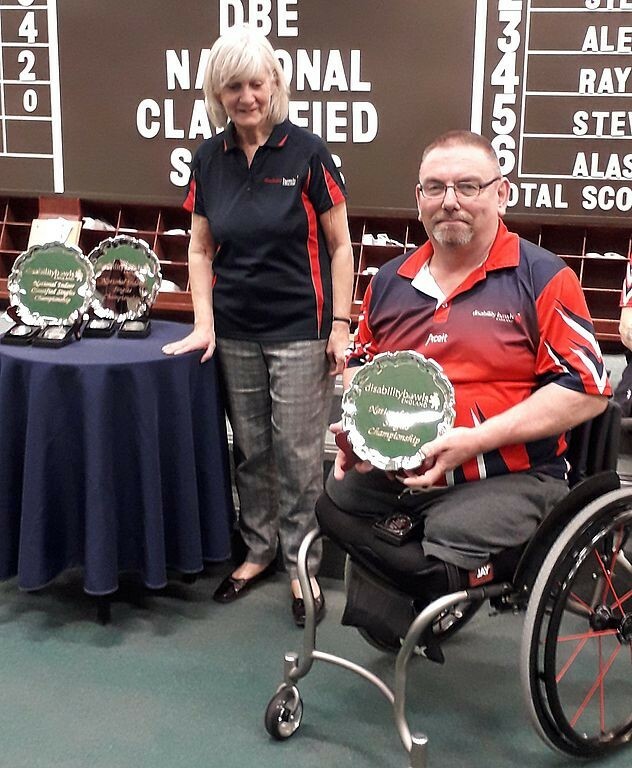 Congratulations to Malvern Hills indoor bowler Joe Peplow who recently became the National B6 Indoor Bowls Singles Champion at the Disability Bowls England (DBE) Classified Championships, held at Nottingham earlier this month. The competition, played over two days on a round-robin basis, was fiercely contested by experienced elite bowlers but Joe put in strong consistent performances across both days, with the title potentially being decided on Joe’s last game against Steve Biggs. After the last end Joe and Steve were tied on a score of 12-12 with the umpire being called in to measure – and Joe’s bowl took the shot by one quarter of an inch. This 13-12 win put him on equal overall points’ score with competition leader Paul Brown. The Championship title now rested on shot difference across the competition as a whole and Joe took the B6 title by one point. Joe only began competing in DBE competitions this season and had already reached three finals in singles and Pairs prior to taking the B6 title at Nottingham, making him a strong contender for future success. Designed by Artwork Creative Ltd.